Serenbe is located more than 600 miles away from the city of Powell. But the community near Atlanta, Georgia has served as a model for the city’s outlook on potential development. Powell City Council voted 6-1 this month to approve a planned residence conservation district. The Zoning and Building Code Update Diagnostic Committee supported the zoning category. “It allows for subdivisions with less density as related to a typical single family developments. It is designed to emulate conservation subdivisions much like you would find in New Jersey. It would be the first of its kind in Central Ohio and would serve as a transitional use between commercial and high intense agricultural districts,” said Powell Mayor Brian Lorenz. The Serenbe community has four main sections each devoted to one of four elements: arts, agriculture, health and education, said Powell spokeswoman Megan Canavan. It includes a 25-acre organic farm, farmer’s markets and edible landscaping. Serenbe founder Steven Nygren purchased the property in the 1990s. The spread of urban sprawl prompted him in 2000 to lead an effort to create a land-use plan that would preserve 70 percent of 40,000 acres, while providing 20 percent more housing than the traditional suburban community. In 2004, the Nygrens began development of Serenbe that mixed agricultural activity with a range of housing choices, along with shops, galleries, three restaurants and a 19-room Inn located in the historic farm compound. “When we started doing Serenbe, everyone thought we were crazy. Who ever heard of having an urban village out in the middle of a forest,” Nygren said in a video on the community’s website. But he saw developing portions of the land as its salvation. There are about 200 such developments nationwide with no authentic ones in Ohio, said Powell Director of Development David Betz. Powell’s conservation district is designed to cluster homes together into neighborhoods with at least half of the development being preserved to create an interconnected greenway system. The communities may incorporate mixed-use and commercial development at major intersections. Prior to approval, the residential district categories required at least 20 percent of preserved open space, Betz said. The category would be used for large-scale land developments, said Powell Assistant Director of Development Rocky Kambo. “How many bison are we going to allow in the 50, the 50 acres?” he asked. Bennehoof failed to send the code back to the committee for further revisions. Details such as the number of animals can be negotiated during the planning process, Betz said. In addition, he referenced the sheep farm on Powell Road to point out that there are already farm animals within city limits and without issue. The zoning category is a result of the Comprehensive Plan Powell City Council adopted in 2015. The plan produced action items including updating the zoning code for future development. It produced ideas such as Keep Powell Moving, an an initiative to improve roadway connections and updating traffic lights. 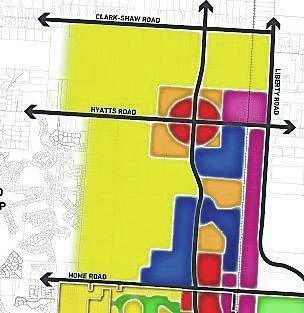 Potential locations for a conservation district include the west side of Sawmill Parkway from Home to Clark-Shaw roads, according to the city’s land use plan. The light green area shows a potential location for a conservation development in Powell. City Council approved the zoning category at a recent meeting. It would require at least 50 percent of the development to be preserved with the rest to be residential, mixed-use and commercial development.